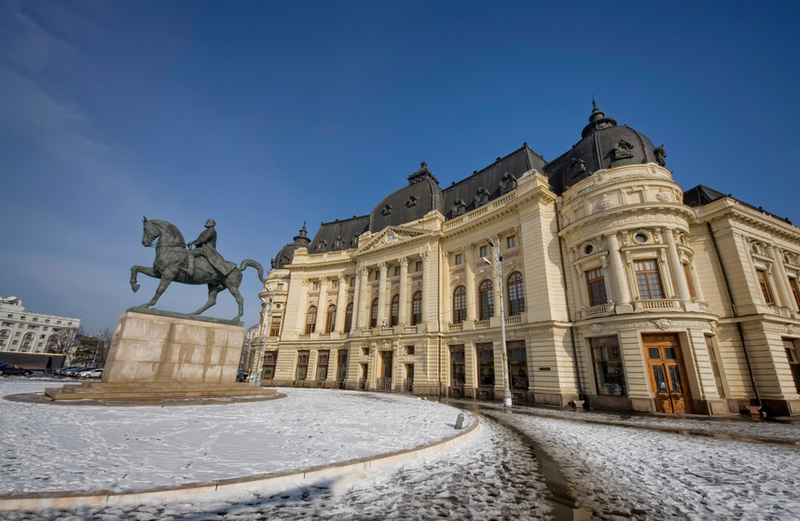 Malte Zeeck, Founder & Co-CEO of InterNations, describes his flying visit to Romania’s bustling capital, giving us five recommendations on things to see and do. 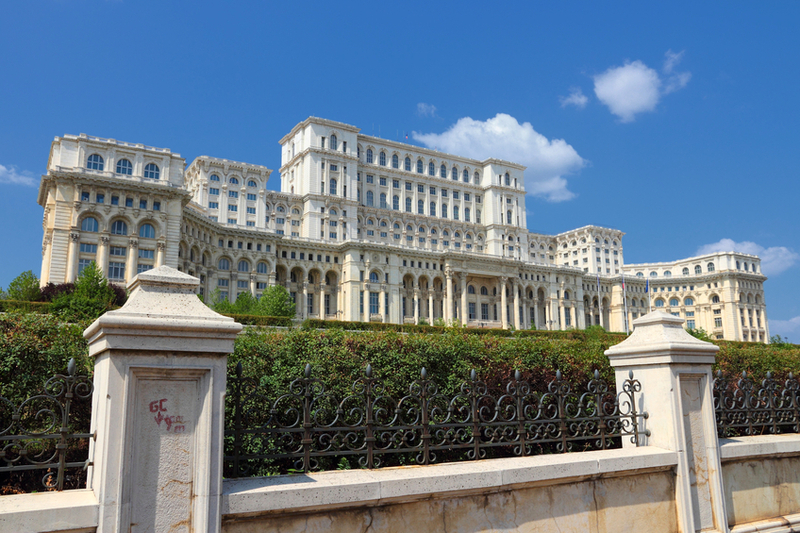 Romania has a really fascinating history, which is reflected throughout Bucharest. On my first day I decided to take a look at the (in)famous Palace of Parliament — one of the best-known and most controversial buildings in Romania, which also happens to be the world’s second-largest building by surface area. I must admit that, in this case, “palace” is a bit of an understatement. I was told that Dictator Nicolae Ceauşescu initiated its construction in the hope that it would be the prime achievement of his Centrul Civic urban development plan. The reaction of the population was mixed, to say the least — but I’ll leave the historical details to the experts. Just trust me when I say the Palace of Parliament is a must-see for anyone visiting Bucharest. Seeing the Palace fueled my interest in seeing more representations of Romania’s history, so I decided to visit Revolution Square. It was in this very square that Ceauşescu gave the fateful speech that led to revolution in Romania and, ultimately, his execution. One of the most eye-catching local landmarks is the Memorial of Rebirth, which commemorates the struggle of those who joined the fight to overthrow communism in Romania. The square is not only for those who consider themselves history buffs, however, as the architecture of the surrounding buildings was also a sight to behold. One of the buildings surrounding Revolution Square is the National Museum of Art, housed in what was formerly the royal palace. Home to Romania’s largest collection of art, the museum is split into two different galleries, and I decided to wander around both. The first — the National Gallery — primarily houses Romanian artwork that represents the country through the ages, and I found it fascinating how Romania’s progression is mirrored in the art on display, from the golden splendor of medieval icons to the austere minimalism of Brâncuşi’s sculpture The Prayer. The second of the galleries — the European Art Gallery — focuses, as the name suggests, on European artwork, both old and new. My recent trips to other cities in Europe have really sparked my interest in art, but my favorite part of the museum was the building itself. As you walk through the galleries, you can really tell that it used to be the home of the royal family. It’s such a grand building, with high ceilings, marble floors, and lofty rooms fit for a king. In the early 20th century, Bucharest was given the nickname “Little Paris”, and I was curious to find out why. The first undeniable similarity is the Arcul de Triumf — what can only be described as a replica of Paris’ Arc de Triomphe. 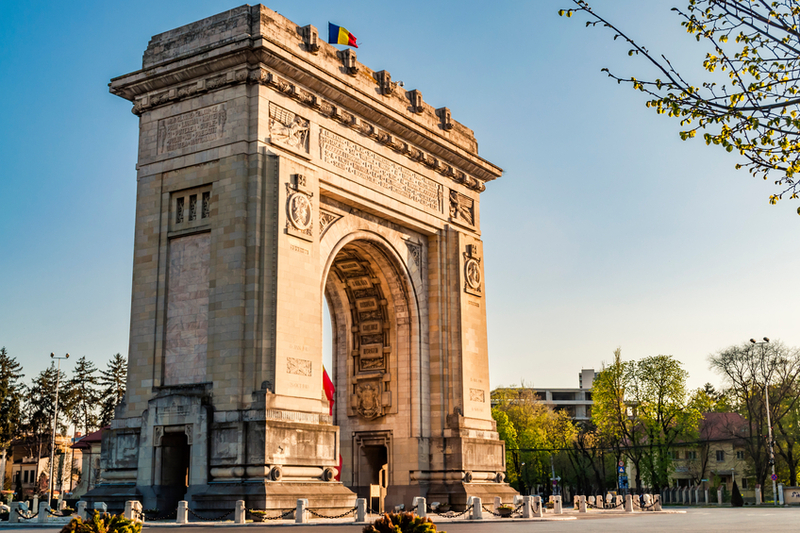 Originally made from wood and erected in 1878, the triumphal arch was built for the troops to march under after Romania victoriously became an independent nation. The elegant architecture, like that of the National Museum of Art mentioned above, is another reason why Bucharest earned its nickname. Also, like in Paris itself, there are a number of beautiful gardens and parks situated throughout Bucharest. Don’t miss out on the pleasure of spending an afternoon wandering through HerÄ�strÄ�u Park — a truly stunning green space surrounding HerÄ�strÄ�u Lake. Much like the Englischer Garten in Munich, it really does make you feel like you’ve escaped the city. When you see the tree-lined pathways and the Belle Époque-style buildings firsthand, the city undeniably has a certain Parisian flair. 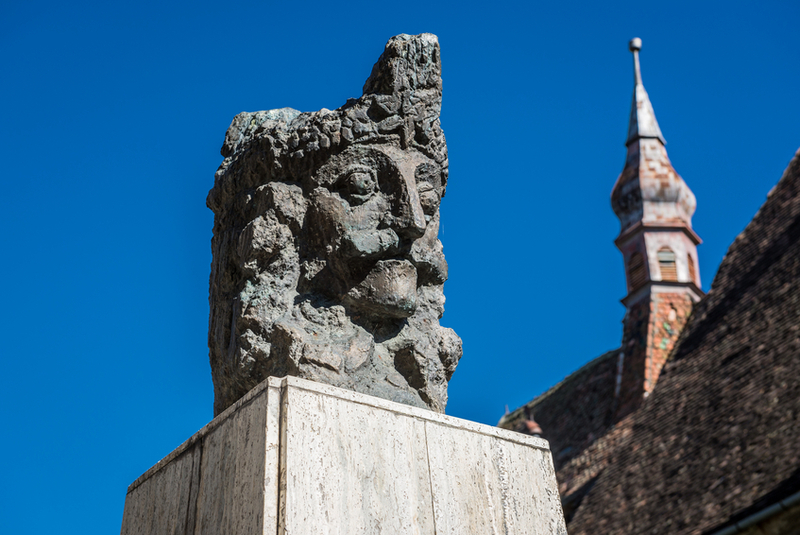 A visit to Romania just wouldn’t be complete without a mention of vampires and, although your mind might go straight to Transylvania, Vlad the Impaler — otherwise known as Vlad Dracula — is (allegedly) buried just 25 miles outside of Bucharest. I found the obscurity of the whole story fascinating. Thanks to his final resting place, some argue that Bucharest is the home of the “original” Dracula, but the real biography of Vlad the Impaler, as well as his reputation as either a bloodthirsty tyrant or a strict but just sovereign, is highly debated. Nevertheless, you can still pay your respects to the infamous ruler at the Old Princely Court. There, a bust of Vlad the Impaler stares over the courtyard and is definitely worth a look at if you’re interested in the inspiration for Bram Stoker’s vampire lore. If you’re brave enough, there’s also the opportunity to explore the remains of the former court from which Vlad once ruled. I politely declined on this offer — obviously not because I was afraid! No matter where you go, sampling some traditional street food is a must. Never being one to turn down an authentic local specialty, I decided to try some mici. 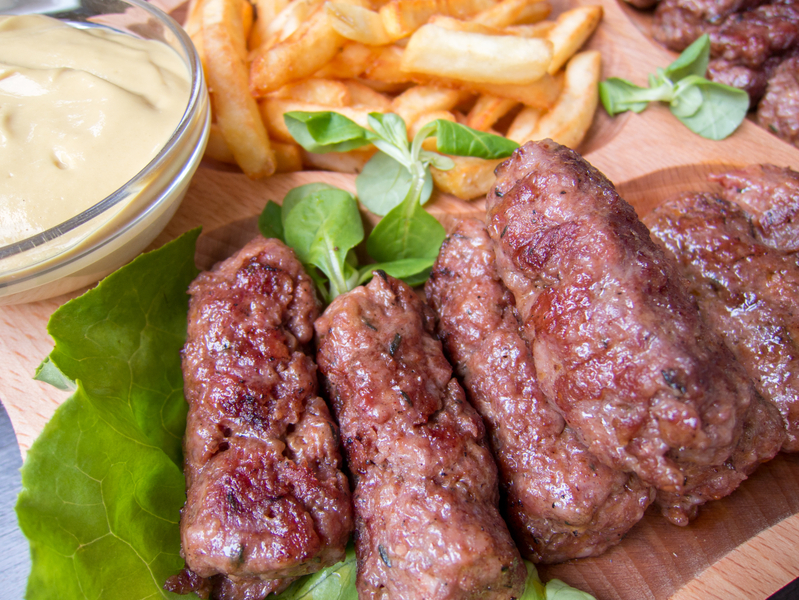 Mici is various types of meat, ground together with spices and rolled into a sort of sausage shape. I had mine with some French fries and Romanian pickles — the one aspect of that tasty dish I could definitely do without. On my last evening in Bucharest, I decided to have dinner at Aqua, a stunning Mediterranean restaurant, situated right beside Lacul Floreasca, with a spacious and airy patio overlooking the lake. The food there was incredible and the delicious meal, paired with the chilled yet sophisticated atmosphere, made for a wonderful final evening in Romania’s capital. Not wanting to end the night yet, I made my way over to Nuba, a restaurant and bar specializing in Asian fusion cuisine, for a few drinks. This may not sound very traditional for Romania, but it really was a lovely end to a great trip.